San Diego has seen quite a few Palmer & Krisel homes come on the market lately, including this Palmer & Krisel-designed home built by the Drogin Construction Company in Tierra Del Cerro. 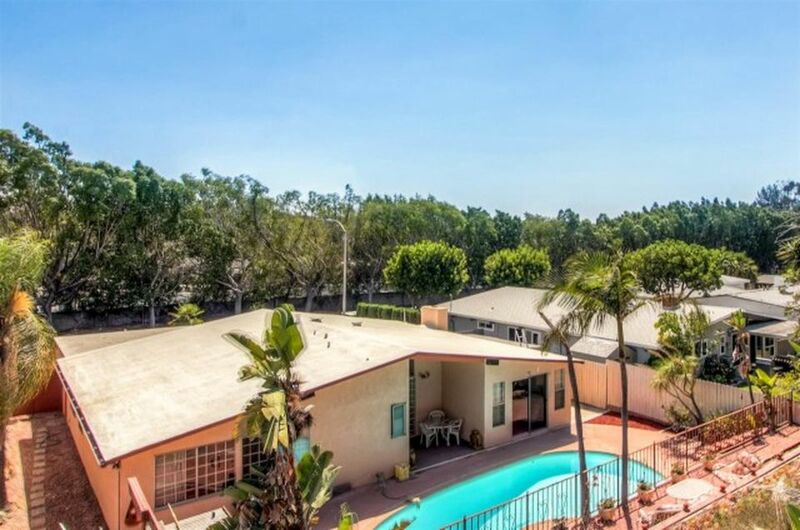 Slightly expanded to 1,850 square feet, this home includes four bedrooms and two bathrooms and a two-car garage on a large 1/4 –acre lot with an in-ground pool and an carries an asking price of $559,000. Situated on Airoso Drive, the home sits above Interstate 8, separated by a small tree row, but still subject to some front yard noise. 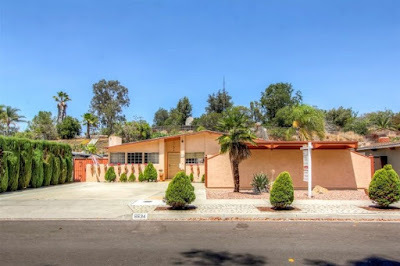 The front yard is low water use, with gravel mulch and a few small shrub plantings. The exterior of the home features a side entry garage with a flat roof, juxtaposed against the gable end of the home, while the original clerestory windows have all been covered over, and mullioned white vinyl windows have replace original aluminum framed openings. 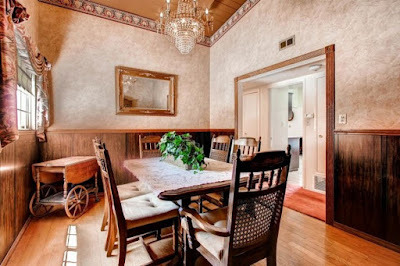 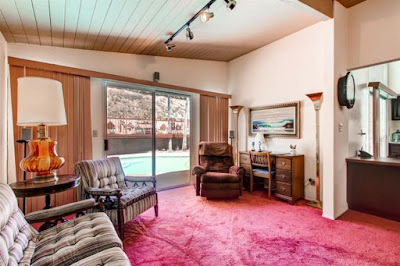 Inside the home, the living room sits at the front of the home, separated from the entry with by an original three-quarter-height demising wall. 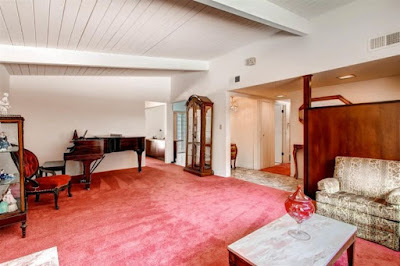 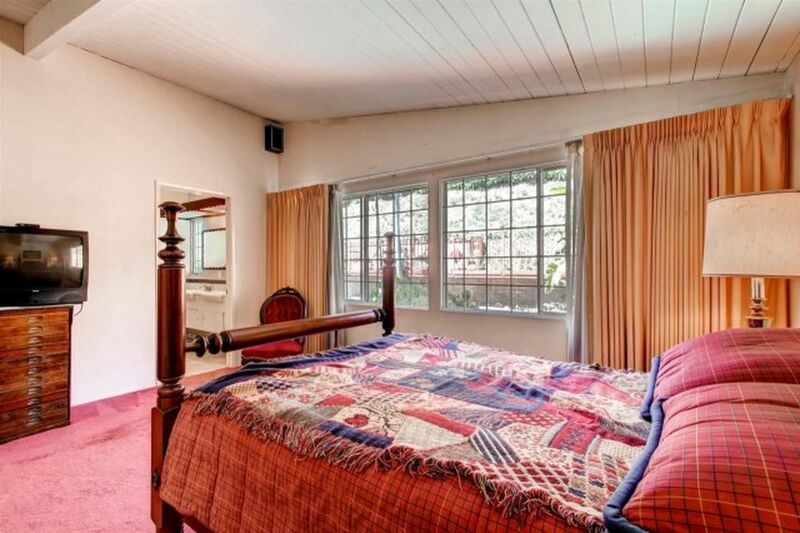 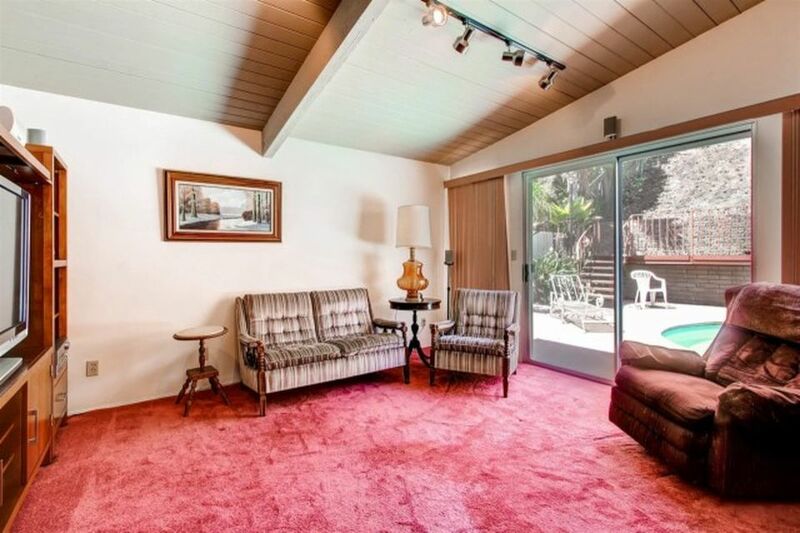 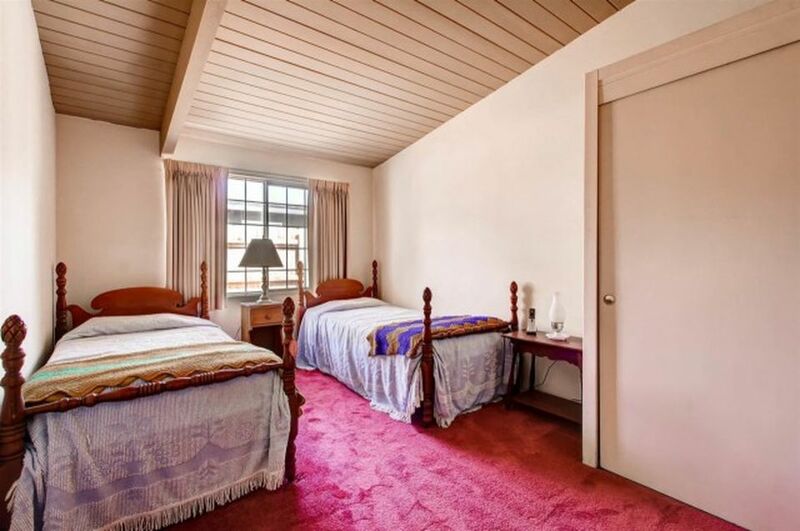 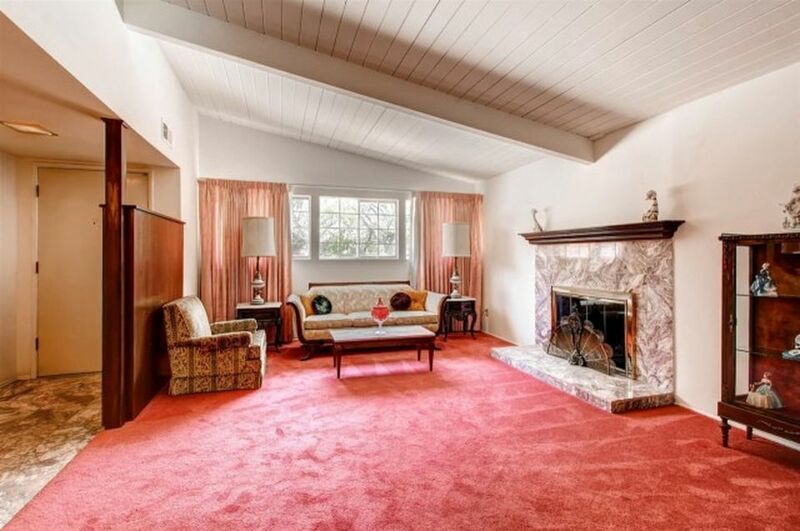 Plush dusty rose carpeting fills the home, a color not seen too often these days, and the original open beamed ceilings are still intact but painted white. 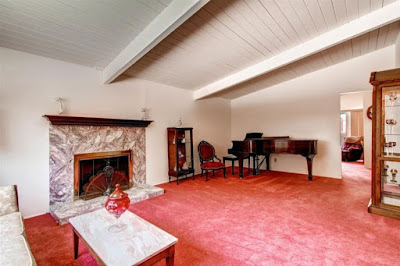 The original modernist fireplace against the west wall of the living room has been replaced with a traditional flat-fronted marble-surrounded firebox. 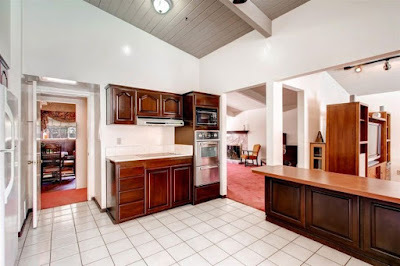 A family room sits at the rear of the home adjacent to the kitchen, with a small bump-out adding on square footage to the home, while the dining room sits in the fourth bedroom at the front of the home. 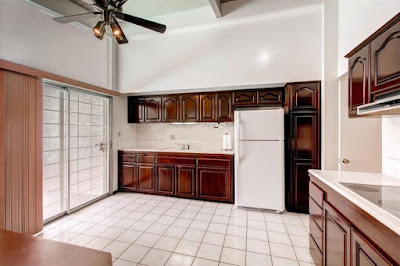 The kitchen sits at the rear of the home adjacent to the family room, and has been updated with traditional raised-panel cabinetry, laminate and tile counters and a mixture of appliance colors. A large sliding glass door leads into the backyard, and a pass through to the family room has been added. 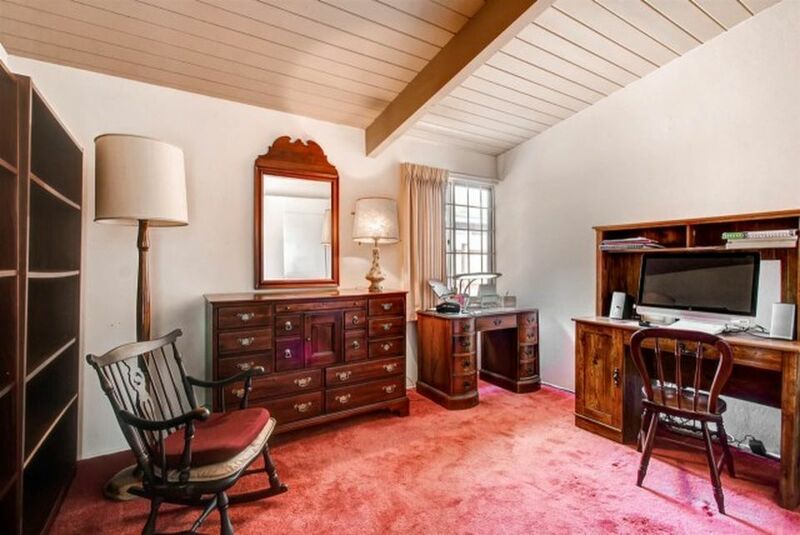 The master bedroom sits at the rear of the home, and features more dusty rose carpeting along with some pretty heavy-duty drapes. 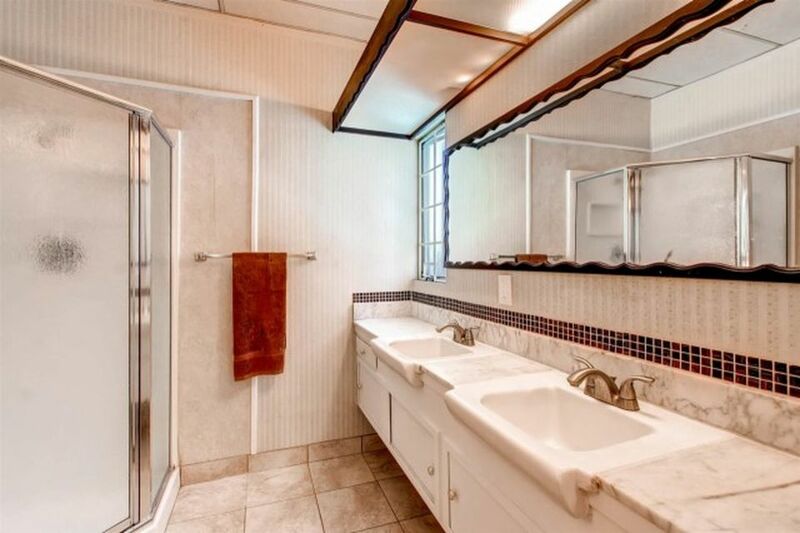 The master bathroom still maintains its original marble vanity and American Standard Pullmans above floating cabinetry, but nearly everything else was last updated in the early 1980s. The secondary bedrooms resemble the master bedroom in terms of décor, and sit along the east side of the home and overlook the side yard. The home backs to a hillside lot, with the backyard containing a pretty decent uphill slope. 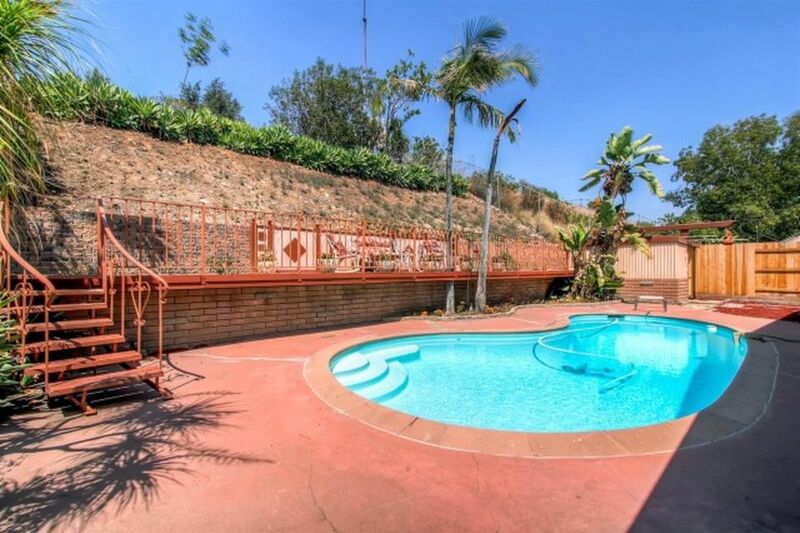 An in-ground pool sits at the center of the north-facing backyard, surrounded by a reddish concrete patio space. A raised patio sits behind the pool, taking creative advantage of the hillside topography, and a natural planting area bisected by a privacy hedge sits beyond the pool. 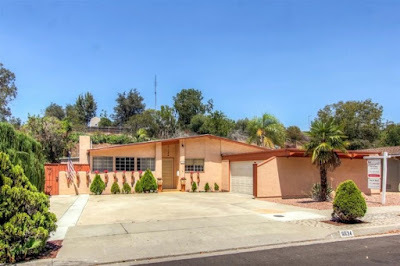 Despite the freeway frontage, this home would make a great restoration project, with great bones and a large yard offering a world of possibilities.